Creative friction – unchaperoned and unprescribed – is Houston’s secret sauce. In much of the country, after a long election stoked by fear and fragmentation, trust in big institutions and one’s neighbor is at historic lows. A June 2015 Gallup poll found that Americans’ confidence in all major U.S. institutions – minus the military and small business – had sunk below the historic average, including trust in the medical system, organized labor, the police, newspapers, public schools, the presidency, banks, churches and Congress. According to 2015 General Social Survey data, only about 20 percent of Americans say they spend time with their neighbors and critically, for the first time in the American story, the rising generation of adults – millennials – is expressing pessimism that their future will be brighter than that of their parents. Drill down, however, to a humid and concrete sprawl just north of the Gulf, and you’ll find a different energy. Houston isn’t behaving like a woebegone, though it, too, has taken a hit from the oil bust of 2015. People continue to move to the flat, hot and humid city at higher rates than any other metropolis. According to the United States Census Bureau, from 2014-2015 Houston attracted 159,083 total and 62,000 net domestic migrants, topping the Census list on new metro area residents. Critically, the newcomers represent those population groups most telling of a metro’s future: millennials, immigrants, and families. “Houston will surprise you,” wrote Katie Couric on a nationwide tour of up-and-coming cities. It was a more iconic statement than perhaps she realized. Outsiders often misperceive Houston as uniformly reactionary and totally dependent upon the energy business, but it consistently busts internal expectations, too. Don’t drive far and you’ll run into unexpected languages, unexpected restaurants, a huge informal economy and just a pervasive – and bracing – sense of random. What exactly is it that sets Houston apart? What is it doing right that makes so many residents confident that their American dream will be found? If it is indeed a city of opportunity, what are lessons that other cities could absorb and weave into their own policies and cultural fabric? Through many interviews, data sleuthing and the everyday experience of living here, I found the following five traits absolutely central to Houston’s distinctive cast: Affordable Proximity, Multipolarity, Social Deregulation, an Active Future Orientation and Humility. What follows is a tour of the city that knows no limits. “There’s always been a haphazard nature to the city, from the beginning,” says Sanford Criner, vice chairman at the world’s largest real estate investment manager, CBRE, and a native Houstonian. “Where Chicago – which was founded the same year  – had an economic reason for being the day it was founded, Houston was a real estate play. These guys came down from the northeast – New York, Pennsylvania – and they bought some land and sent out flyers. Where others saw only a malaria-ripe swampland along the banks of the Buffalo Bayou, Augustus Chapman Allen and John Kirby Allen saw promise, and convinced people to take a gamble and move. This rambunctious “come one, come all” attitude continues to define the city’s development, 180 years later. Houston is famous for its no zoning policies, the fruits of which are visible in the hodge podge of commercial and residential hubs evident on a first drive in from the airport. The apparent haphazardness may dizzy outsiders, but for residents it’s a gift of something my colleague Tory Gattis calls “affordable proximity”: the ability to live close to one’s job and civic priorities while keeping the cost of living affordable. It’s a challenge that has become onerous in many cities, but one that Houston manages to tackle with surprising efficiency. 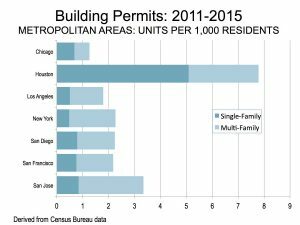 Since 2010, Houston has expanded its housing stock to issue construction permits for 189,634 new units, paralleling the population growth. This is in sharp contrast to competitor cities such as New York, Los Angeles, Chicago and the Bay Area, where construction tends to lag behind population. Houston is uniquely able to create housing to meet need. The populations in both New York City and Houston have grown significantly in the past six years, but New York, like many big cities, has not come close to meeting demand. 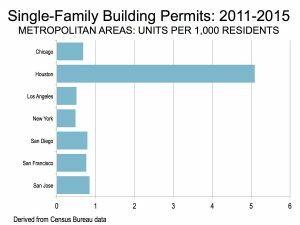 A lot of this has to do with sheer land availability and willingness to expand outward, but Houston’s light regulatory touch has crucially allowed developers to be in sync with consumer need and preference, without the red tape that slows other cities’ building and adaptability. A key result has been a greater level of affordability, and of choice. 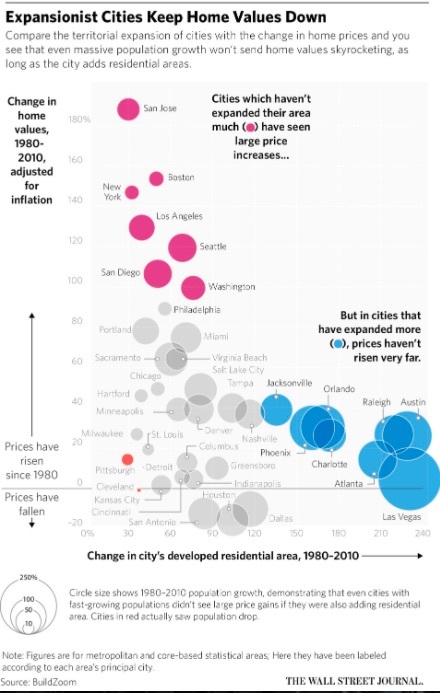 In April of 2016, The Wall Street Journal highlighted groundbreaking research by Issi Romem, chief economist at real-estate site BuildZoom, showing that the cities that have expanded geographically have kept their house prices more affordable. According to the National Home Builders Association, more than 60 percent of homes in the larger Houston metro area are now considered affordable for median-income families, compared with only 15 percent in Los Angeles, once ground zero for the dream of homeownership. According to Zillow, renters in New York, long a renter dominated town, spent 41.4 percent of their income on housing in 2015, whereas the share for their Houston counterparts was just 31 percent. The Demographia International Housing Affordability Survey applies the Median Multiple to measure housing affordability, which divides the median house price in a metropolitan area by the median household income. The Survey provides ratings for all major metropolitan areas in the U.S., and Houston consistently comes out as more affordable than cities like Portland, New York, San Francisco and San Jose, all of which have more restrictive regulations. Houston’s housing is also diverse. Houston has become the national leader in new multifamily units, helping to preserve and expand access to urban living. 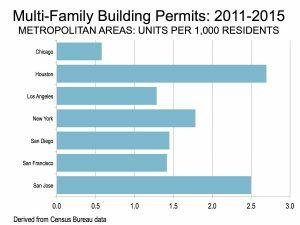 At the same time, it has led the country in new single-family houses, inside and outside the loop. adopted in 1999 shrunk the required residential lot size from 5,000 square feet to 1,400 square feet, enabling town home development in high demand areas proximate to jobs. Proximity to work is especially appealing to millennials, who have moved to Houston in droves. The U.S. Census Bureau showed a 25 percent increase in millennial residents between 2000 and 2013, with millennials currently making up 24 percent of Houston’s total population. Many of these new adults want to reduce their commutes, or even ditch their cars for the sake of enjoying a more seamless transition between professional and personal life. Houston offers this possibility across urban and suburban areas, the multipolarity of business centers providing flexibility to carve a feasible triad of work, residence, and play. 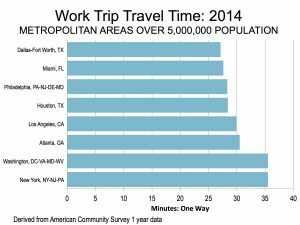 Despite the impression of endless freeways, Houston’s commute times are better than its equivalent cities in population size. One-way commutes were 28.4 minutes in 2014, according to the American Community Survey, making Houston the fourth best out of nine comparable cities. Houston also does very well on an international scale with respect to traffic congestion, according to Tom Tom in 2015. It is ranked fifth out of the 38 urban areas that have populations over 5 million. None of this is to suggest Houston still doesn’t have big room for improvement in the traffic department, but it’s credit to the city’s decision to dramatically increase roadway capacity and arterial streets that it has managed to improve its ranking in traffic congestion while experiencing a huge increase in population. 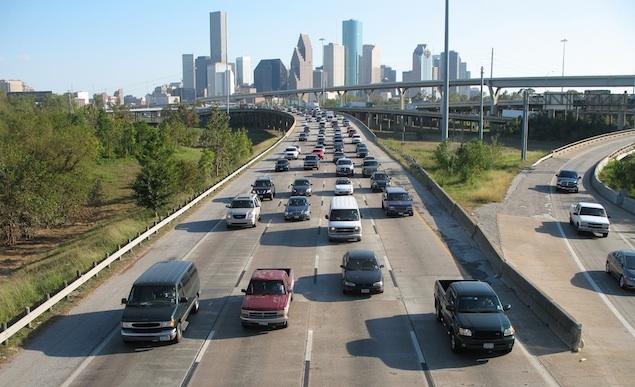 According to the Texas A&M Transportation Institute, in 1984 and 1985 Houston was ranked with the worst congestion in the country, even worse than Los Angeles. Now Houston is ranked 10th, even as it’s nearly doubled its population, from 3.5 million in the mid 1980s to 6.5 million today. Only Atlanta and Dallas can boast similar improvements. When most Americans think of the Houston economy, oil and gas rule the perception. And while the energy business still undergirds much of the city’s economic experience, Houston now boasts other huge economic assets: the world’s largest medical complex, one of the world’s busiest trading ports, the third largest manufacturing hub in the country, a booming technology sector and a wide range of small to medium-sized businesses, including a thriving informal sector of immigrant-run businesses stretching on for miles west of the city. This has led to demand for labor at all skill and education levels, unique among the top ten largest cities. “Best Online Programs in 2016,” said U.S. News & World Report about the University of Houston. “Top Cities for Competitiveness to Attract Investment in Chemicals & Plastics,” said Conway about Houston in 2015. “Best Hospitals for Adult Cancer – University of Texas MD Anderson Cancer Center” said U.S. News & World Report in 2015. “Top Blue-Collar Hot Spots,” said Forbes in 2014. “Most Favorable Metro for STEM Workers [Nationally],” said WalletHub in 2015. Houston is no stranger to “Best Of” lists that today’s mayors scour. But what’s notable is the cross-sector nature of the superlatives. According to a January 2016 report from the Texas Workforce Commission, 20.5 percent of Houston’s workers are in Trade, Transportation and Utilities, 15.5 percent are in Professional and Business Services, 12.8 percent in Government, 12.7 percent in Education and Health Services, 10.2 percent in Leisure and Hospitality, 8 percent in Manufacturing and 7.4 percent in Construction. The city has learned from its mistakes. The 1980s, which saw a similar slump in oil prices, bulged in profligate building and overconfidence. According to the Greater Houston Partnership, from 1982 to 1986, developers built more than 100,000 single-family homes, most of them without a signed contract from a purchaser. Even when the region lost more than 200,000 jobs, they continued to build, including adding more than 71.7 million square feet of office space while companies were laying off staff and declaring bankruptcy. Today, the office market is much tighter, banking is better regulated and better capitalized, and few homes are built without a signed contract. Most importantly, the region is creating jobs that aren’t in energy. Houston is deregulated economically, but it’s of greater note that it’s deregulated socially. People come here from every tribe and tongue, and the relative youth of the city combined with its scrappy DNA means that there really isn’t a dominant Establishment, certainly not one that wants to block the efforts of ambitious newcomers. This city’s always been a mixer; you just have to be willing to share what wakes you up in the morning. Marlon Hall is an African American filmmaker and native Houstonian who started Folklore Films, a documentary production company created to “tell better stories to our city about our city.” He and fellow filmmaker Danielle Fanfair have featured former Mayor Anise Parker, arts patron Judy Nyquist, internationally recognized musical artist DJ Sun and other community figures. As the Folklore Films crew has gotten better acquainted with Houston residents from across the social spectrum, Marlon locates the vocational “why” as central to the city’s currency. This kind of invitation has attracted the motivated from all over the world, with the city now pulsating with 145 languages. An international city since the day it started growing, now more than one in five Houstonians are foreign born, with the 2013 American Community Survey reporting that 65.2 percent of the foreign born population were Latin Americans, 24.1 percent were Asian, 4.5 percent were African and 4.7 percent were European. As of the 2010 Census, Greater Houston does not have a majority racial or ethnic group.People come because they see opportunity, and because they sense in the visible randomness the potential for surprise ingredients to leaven the traditions they’re bringing with them. This is as true for immigrants as domestic migrants, with the city’s celebrated restaurant scene born out of the unexpected merges of flavors from cultures that don’t typically mix. Underbelly’s Chris Shepherd, Bistro Menil’s Greg Martin and Lucille’s Chris Williams all site Houston’s diversity as a major factor behind the city’s flavorful palate, in both story and succulence. It’s not soul food, but Southern. With a rustic European style, and a multi-generational American story at the heart. Bistro Menil is another spot that takes a slice from Europe and re-interprets the classic dishes for Houstonians. Its patrons come from Rice University, the Medical Center, the Museum District and beyond, the attraction of the world-renowned Menil Collection standing just across the street. 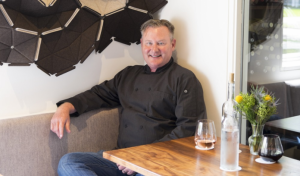 Inspired by the concept of cask wine, which head chef Greg Martin discovered on a trip to Rome, Bistro Menil relies heavily on relationships with cosmopolitan – yet locally centered – Houstonians. 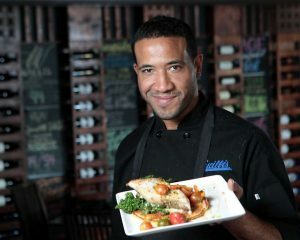 It’s not just the food that shows Houstonians willing to work together across silos and lift up the local talent. The fundamental social egalitarianism combined with a pervasive “show me what you got” curiosity creates something very unique. Hipster cocktail bars seem no more privileged than authentic Vietnamese restaurants than classic barbecue and the iconic Rodeo. The no zoning rules make commercial strips like Westheimer Road a cauldron of cultural mismatches: The New York Times’-celebrated Underbelly is sandwiched between three tattoo parlors, a Catholic guild clothing store and the latest in coffee-roasted curation. There are so many opportunities to mix with those different from you that only the snobby find themselves bored and excluded. Creative friction – unchaperoned and unprescribed – is Houston’s secret sauce. “This is a city that does not believe in censorship,” says Arning. Houston is not Silicon Valley, but its entrepreneurial DNA is unmistakable, dispersed across many fields. The city emanates a conviction that people should have the freedom to determine their destiny, sometimes to the point of overlooking those that don’t have such clear vision, nor the resources and social networks to make it happen. The city is extremely growth- and future-oriented, embracing of change and risk. True to its namesake in Sam Houston – himself a failure before reinventing himself – Houston grants permission to fall hard. This is true across sectors – for-profit, social service, and philanthropic. Ella Russell was an African American single mom working for AT&T when a breakup with her partner caused significant financial hardship. Her two boys, then age 3 and 9, came home from school asking to bring in treats for a holiday party. Russell felt helpless, all disposable income run dry. But she did find sugar, flour and eggs in her pantry. Three years later, her friends urged Russell to turn the sweetness into a business. “I had no business experience other than what I knew working in corporate America,” Russell says. 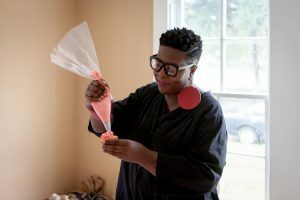 “I really winged it; I had no basis but the support of my friends.” In a couple years, she went from serving family and friends to delivering in seven different states. Brilliant improvisers, the entrepreneurs don’t start out with concrete goals. Instead, they constantly assess how to use their personal strengths and whatever resources they have at hand to develop goals on the fly, while creatively reacting to contingencies. By contrast, [highly successful] corporate executives use causal reasoning. They set a goal and diligently seek the best ways to achieve it. If we could take her comparative study and extrapolate from it particular civic traits, you might see Chicago as the sort of personality for corporate leaders, Houston for the entrepreneurial. The city is rife with improvisers, fueled by a deep prioritization of human relationships, an affection for eccentrics and a perennial optimism that loves to build before over-planning. 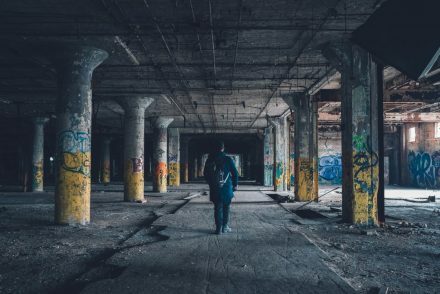 The fact that there are lots of open spaces to create, and fill, encourages new entrants into any kind of market, be it technological, artistic, or consumption-oriented. This goes well beyond profit-seeking ventures. The Chronicle of Philanthropy identifies Houston as one of the country’s most generous cities, ranking at #11 for giving as a percentage of adjusted gross income – three stops behind Dallas. 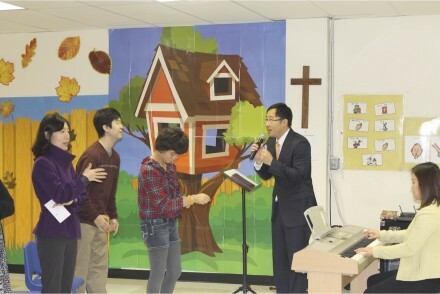 This enhanced quality of life has involved a renaissance in the arts, a proliferation in family-friendly green spaces, advancements in medical facilities and, increasingly, innovative educational ventures. Houston’s acclaimed Museum of Fine Arts is currently undergoing a $450 million redesign, two-thirds of that already raised with the help of giant gifts from pipeline entrepreneur Richard Kinder and money-manager Fayez Sarofim. 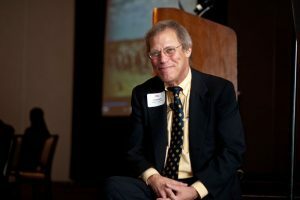 Kinder and his wife Nancy have also given $30 million dollars to a public-private partnership aimed at reviving the Buffalo Bayou from a polluted waterway to an attractive waterfront graced by 20 miles of hike-and-bike trails, canoe launches, playgrounds, art installations, and outdoor performance venues. Long considered the ugly hothouse of the south, Houston has suffered from a long-running inferiority complex when comparing itself to other cities. Even since rising to the top of dozens of “Best of” lists in the last five years, the residue from generations of modesty remains. 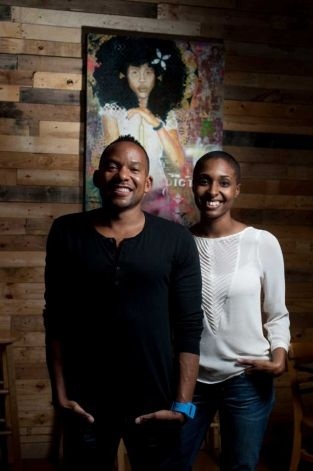 Before Marlon Hall was running Folklore Films, he and Danielle began something called the Eat Gallery, an incubator for budding chefs around the city that sought to turn food trucks into restaurants. In ramping up for this effort, they went around and asked Houstonians questions about where they found meaning, where they felt they fit, where they felt they made a difference. They discovered that people had a low city esteem. “They’d go to a great ballet, and they’d be like, wow, this reminds me of Chicago, Hall recalls. “They’d go to a musical performance and be like, oh, this feels like New York. People were telling the worst stories to the city about the city. Folklore discovered That Houston is a city of new beginnings – and it always has been. When you move here, the past intrigues less than how you intend to exploit the future. Whether you’re an immigrant from another country or a fellow American that’s left some entrenched failure behind, Houston pulses with a forward-looking frankness grounded in a humility shaped by whatever came before. This drive paired with an individual and corporate self-awareness defines the city’s character – culturally, spiritually and even economically. “Then there’s Bernice, a musician I know. He shows up on so many different people’s projects. He was the musical director for John Chitto, for Miles Davis, others. And there’s this at-homeness that he has in his performance, he knows his country, but he’s also a metropolitan kind of guy. He’s progressive, but he’s backwoods. Houston’s increasing diversity helps keep the city changing, and that makes it hard for those who would prefer to stand pat. There is no room for insularity because there is no homogeneity. Your ideas are constantly being chiseled and countered by the Other— often someone you never heard of. No one has the luxury of feeling superior because everyone’s in a gem tumbler with folks not like them. It makes the city competitive, but not in a way that produces monopolies. 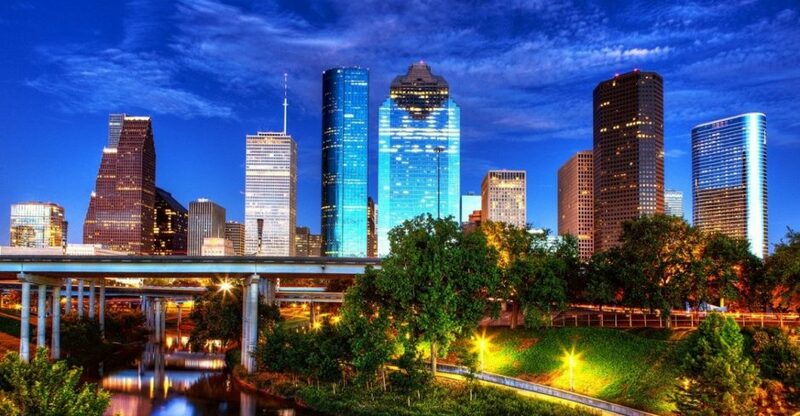 Houston residents tend to be proud of their individual accomplishments, and feel an affection toward the place that allowed those accomplishments to happen. But there’s a recognition that success is the result of many different pieces coming together, usually organically and iteratively. The environment invites people to fulfill their individual destiny, and almost discourages any person or governing body to take credit for Houston’s successes as a whole. Houston is a bit like Israel. It took a certain entrepreneurial spirit to put a city on this less than hospitable piece of land, and it continues to beat the odds to this day. And while its adventurous impulse is what continues to draw people in, there is no avoiding the fact that what you put into the world must survive. Houston is a much better place to live than it was 30 years ago. But will it continue on this trajectory, or even sustain the fruits of its triumphs? We are hopeful, but there needs to be a concerted effort to reform and improve Houston’s educational opportunities, its transportation and traffic infrastructure, and a more general care to respect tradition and an intensive effort toward more inclusive mobility. The city’s grown so big, so fast, it could inevitably buckle under its own weight. Despite precedent, massive infrastructure may not be the answer, especially given the shifting preferences of a younger population and the costs of maintenance. New mayor Sylvester Turner is considering expanding to two HOV lanes and providing express bus service. 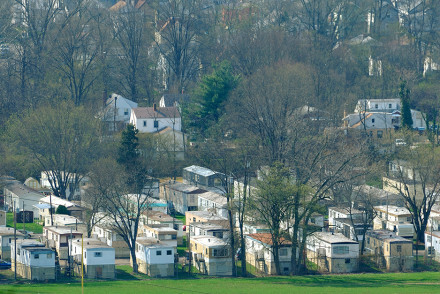 Others advocate for densification of the more traditional gridded neighborhoods that are far from holding their population capacity – but without adding infrastructure, and without pushing anyone out. And then there’s the perennial education challenges. In the last 20 years, Houston has cultivated a series of signaling mechanisms that continue to draw people into its orbit. It’s a welcoming city, driven both by affordability and diversity. Majority opinion says “anything is possible if you’re willing to work hard,” a conviction increasingly on the decline in the rest of the country. And, crucially, it’s cultivated the conditions necessary for entrepreneurs to have a field day. “The assortment of motley ingredients” noted by innovation scholar Sarasvathy describes Houston in a nutshell, and the regulatory instinct has been to stay light, allowing imported imaginations to run experiments without interference. The city’s not beautiful upon first blush, nor does it offer the charm of pedestrian fancy that denser cities boast. But in an era of civic unrest, with many up and down the social spectrum feeling disconnected and marginalized in their own cities, Houstonians can still shape their destiny. The city’s the clay; residents potters. The wide range of household sizes and work-life arrangements makes Houston like the cowboy boot its Rodeo celebrates – malleable for the needs of each life stage as residents progress through singleness, marriage, family and retirement. Residents are not trapped by the regulatory, financial or even social limits that other cities increasingly impose. The mindset is one of abundance, not scarcity. Apter words haven’t been written, and in an age of heightened political frustration, a sclerotic economy and shifting structural tectonics, it could be that the “starting over” ethos that Houston embodies is precisely what the country itself needs, and what other cities should seek to foster in their own policies and cultural climates. Innovation, reinvention and reinterpretation, after all, lie at the heart of the American genius. 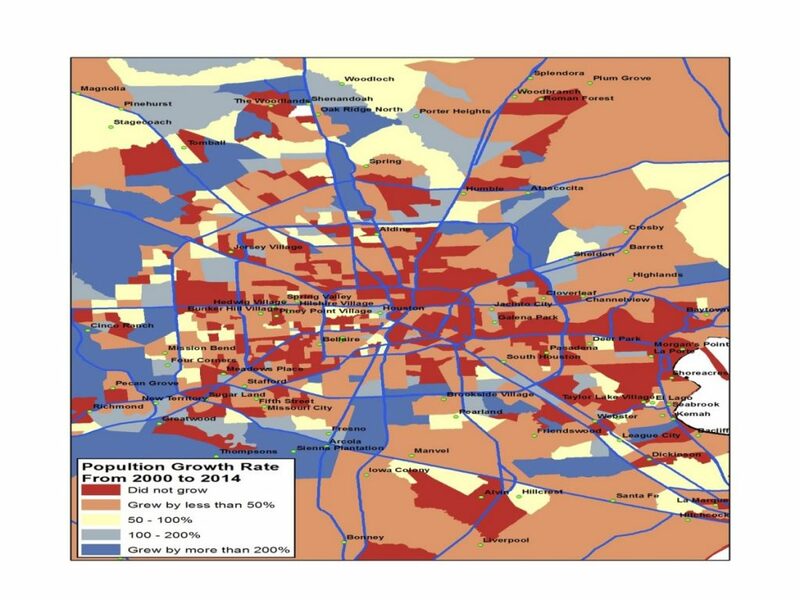 This essay was originally published in a November 2016 report the Texas Business Journals and the Center for Opportunity Urbanism released on the big four: Dallas, Houston, San Antonio and Austin.